Rock Your Daily Routine Like An All-Star Entrepreneur #Infographic ~ Visualistan '+g+"
Every morning, Jack Dorsey, Square CEO, wakes at 5:30 to meditate and go for a 6-mile jog. And every morning, Reem Rahim, Numi Organic Teas Co-Founder, writes down on a stick note the list of items she wants to accomplish that day. So what do these super successful entrepreneurs have in common? They stick to daily habits and routines. 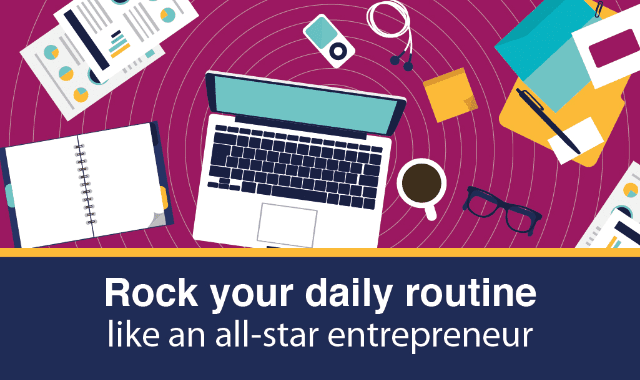 Even if you’re not a famous CEO, there are some tried and true strategies to build a successful daily routine like an all-star entrepreneur. From listening to employee feedback and learning to delegate to waking up at the same time every day, check out the daily routine ideas below to see what may work for you.